FitNotes includes a selection of utilities and tools to aid you in performing your workout and lets you focus on the important stuff. 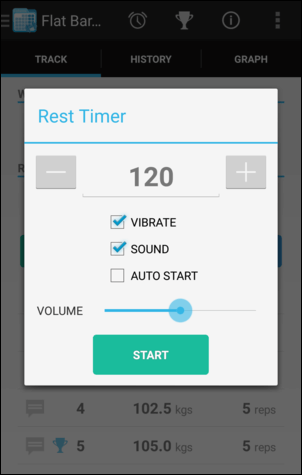 The Rest Timer allows you to countdown your desired rest period in between sets and can alert you when the time is up. The Rest Timer will remember the time period used previously but you are also able to specify a custom time period for each exercise (see Exercise Notes) if for example you would like to have 60 seconds rest for Pullups but 180 seconds of rest for Deadlifts. Vibrate: When the timer hits 0 the device will vibrate for a couple of seconds. Sound: When the timer hits 0 a 'beep' alarm tone will be played. You can adjust the volume of the tone using the slider bar above the Start button. Auto Start: When this option is selected the timer will start automatically each time you create a new set (or when you complete a set if you are using the Mark Sets Complete setting). 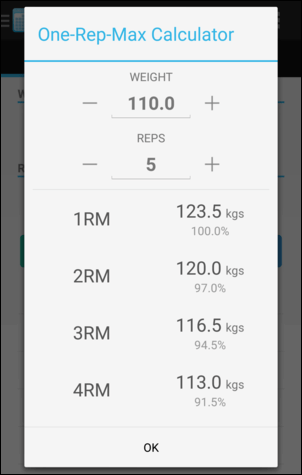 The 1RM Calculator allows you to calculate the Estimated 1RM (an estimation of the maximum amount of weight that could be lifted for 1 rep) of a given set by entering the Weight and Reps used in that set. The 1RM Calculator uses this Estimated 1RM value to also generate estimates of the 2RM, 3RM, ..., 15RM which can be useful in planning the weight to use in your subsequent sets. Some strength training programs (such as Jim Wendler's 5/3/1) use a percentage-based progression system and require you to calculate the weight of your sets based on some percentage of your current 1RM. The Set Calculator allows you to calculate the weight of these sets by entering a base weight and selecting a percentage value. 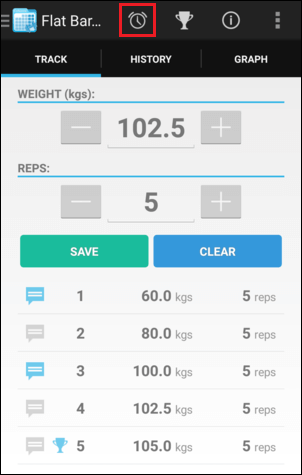 Tap Select Max to display your current personal records for this exercise and easily select your 1RM (or any other RM) to use as the base weight. Tap Select Percentage to select from a list of predefined % values or tap the field to enter a value directly. 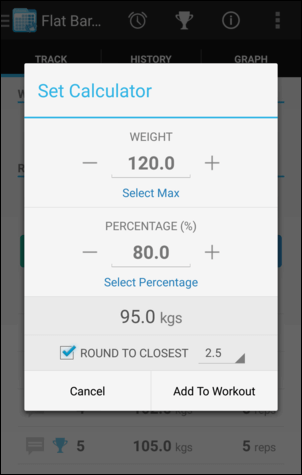 Tap Round To Closest to round the calculated value to the nearest 2.5, 5.0, 10.0, etc to ensure that the weight is suitable for a barbell. Tap Add To Workout to create a set using the calculated weight and add it to your current workout. 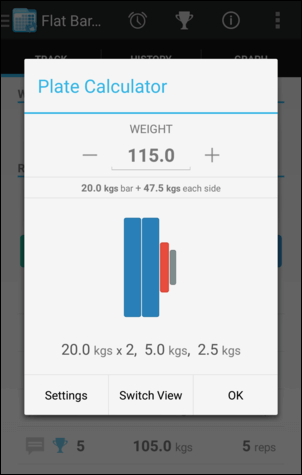 The Plate Calculator allows you to enter the weight of your next set and will display the plates that are required on each side of barbell to make up that weight. 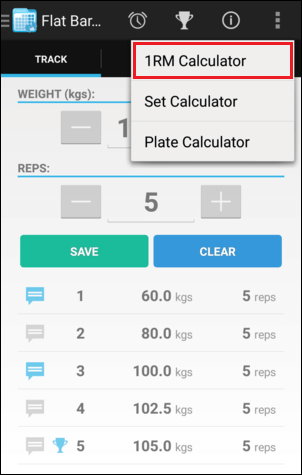 The Plate Calculator is completely configurable and can be customized according to the plates and barbells that you have available by tapping Settings. You can indicate that you have a plate available by tapping the checkbox displayed to the right of the plate weight. 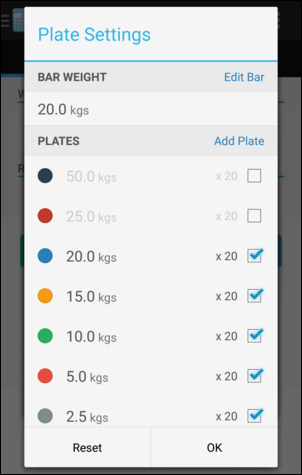 You can tap a plate in the list to edit it if you would like to change its weight, colour, or alter the number of these plates that you have available. Tap Add Plate to create a new custom plate. 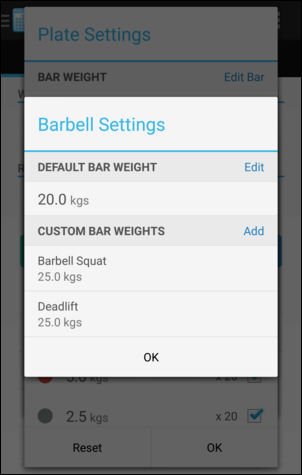 Tap Edit Bar to edit the default barbell weight or to configure a specific barbell weight for an exercise.